Wow! Sharon! I wondered where you disappeared to! My goodness, Denise Ann is right! You have been a busy, busy farmgirl! You GO sister! AWESOME!!! I've been canning up a storm... SO many different things that I cannot even remember them all... Veggies, fruits, meats, pre-made meals... SO great! And the night before last, my hubby and I went out to inspect the garden to find an abundance of peppers all ready to pick! I'm taking a much needed break today from canning, but tomorrow, I'll be pulling everything out again! I am just soo excited! This year, we used green manure... Usually we don't have much at all to harvest until late July/early August. But this year? Oh my gosh! My garden is FLOURISHING!!! It looks like early August out there - AMAZING!!! 6. Used up leftovers and did not discard food. I'm loving reading thru this thread. Like many others I make my own laundry soap. I spent about $23 to make a batch last March and I'm still using it now. It has definitely saved me a bundle! I've been much more strict about meal planning and sticking to the plan and not eat out. It's hard on days like today when the husband and I both work. I washed a load of jeans last night, and was able to wake up a few minutes early today and get them hung on the line before leaving for work. The weather forecast insists there is a 0% chance of rain, which now that I have laundry on the line means it'll rain. If I don't hang laundry its sunny all day, and if I do it'll rain lately. I am working on only eating what I already have in the cupboard or freezer. I need to sort through and see what I have before I buy anymore. Made laundry soap and I'm not using the dryer unless I absolutely have to. I am really watching our electrical and grocery bills. Right now the air conditioning does not come on except on super warm days ( above 90) and then only for a short period of time. We use fans and dress lightly. I am working on freezer meals. Cheap, healthy and easy to fix. Chicken Parmesan Casserole, Tortilla Soup, Quiche, Pasta with roasted Veggies, Black Bean Burritos and Salmon Patties are just a few. We no longer have cable tv. We use Netflix and Hulu with Roku. So we spend about 20.00 a month for tons of TV channels. Got a load of laundry put on the line yesterday, and another this morning. I did the math and it saves me about $2 per load to dry them outside versus using my dryer, plus we save money on since the AC unit doesn't have to cool the house down to compensate for the dryer heating up the laundry room. This week, I made another double batch of my laundry powder. Such a savings! By the way, I read in one of MaryJane's magazines or here (can't remember@!) that you can also make dishwasher detergent using equal amounts of washing soda, Borax, and 1/2 cup white vinegar for the rinse cycle. So I started using it and found this works just as well as any store bought brand and saves me lots of money too. Overall, I am working hard to create meals that have fresh ingredients and not purchase any unnecessary calories in those tempting bags and boxes. Food costs have risen over the past 18 months so it is harder and harder to keep the food budget within the same parameters of the budget. The only way I can do that is to stay away from large sections of the grocery store! I admit I am a sucker for yummy baked goods. Best to not even go there!LOL!! The challenge for me is to eat healthy and use my shopping dollars to get the best nutrition for the price. I think we all agree this is hard to do. We also recently downsized out cable bundle for the TV. Who watches those gazillion stations anyway? Wow everyone has been really busy. Same here. I am making my grandson a toy box, so a lot of watching paint dry. I have really been enjoying the project. When I am done I will have about $50 in it. I've been looking and around here all I've been able to find are the particle board ones and they want 70 to 150 dollars for them. Mine will be real wood and heavy. When I get it done I will post a photo. Today, I made another batch of laundry soap. I am so glad I started using homemade, love the way it makes my clothes smell and feel. I have also been making dishcloths. I have 4 done so far, just need to weave in the ends. I love the pattern and think they will make nice gifts. Yesterday my sister, Bobbie, and I went to local fruit/veg stand. On the marked down shelf I found a box lid of large bell peppers;2 green, 5 red, and 3 yellow for $2.50. A few bad spots but could use all peppers. I traded a red & yellow pepper to Bobbie for 2 or her home grown tomatoes. Their hanging baskets were $6. I bought two yellow lantanas to plant in the fall. Saved $16. Then we went to Salvation Army. Bought woman's vest, boys shirt, yellow linen tablecloth, and two berry baskets for $8 including tax. You are a winner!! I love the seat/cooler combo! Great find. The magnet letters are great, my daughter had the fisher price magnet letters and numbers back when she was little. Kept her busy for long periods of time. You found some great stuff. Thank you everyone for sharing, I love reading what everyone is up to and gleaning some ideas too! I'm glad that the laundry soap works for you. I have tried so many different recipes and rinse with vinegar. At first they seem great but then they seem to leave a slight film on our clothes. I was using Charlie's but then it started going, downhill I tried the Nellie's and that was okay. We decided to give Mrs. Meyers a try and really like that. I can catch a good sale on it once in a while. Good for you sticking to your menu and budget! That helps so much. I would love to see a pic of your coffee table, isn't awesome having a hubby that can do things like that? I have trained myself to 'shop' from our pantry. It's amazing how creative one can be :) I am still patiently waiting for a clothesline. Right now we don't have much room in our home for hanging things indoors. I love your quote: "The challenge for me is to eat healthy and use my shopping dollars to get the best nutrition for the price." Looking at purchasing nutrition is the way to go! Someone is very blessed to have you for a grandma aren't they? I look forward to seeing the picture of the toybox, that is a perfect gift.Great deals on the cooler and the magnet box. Great deal on the peppers and then to barter a couple for tomatoes, even better! I love buying plants at the end of season. I try to purchase shrubs or perennials so they will keep producing and I can divide them and share. Our garden is doing well for being planted so late. This year is the best it has ever looked. Every year I learn something new and incorporate that knowledge. ~A friend gifted us with some zucchini. I know you are probably thinking "you mean cursed you with some"? I accept any free produce and use it. At the very least our pigs can feast on it :) I made 4 loaves of Zucchini-Strawberry Bread with it and with some strawberries that were getting a little bit soft. The loaves went in the freezer this morning. ~Another friend blessed us with a yogurt maker. We have been purchasing raw milk and started making our own yogurt, wow, what a difference. ~I have been trying to save water. When cleansing veggies and fruit I use a bowl to catch run off and water my houseplants with it. ~Bartering. For the past month or so we have bartered my honey's handcrafted soap and various items for: a sock darner, handmade crocheted items, Mulberry Jam and craft supplies. ~Went to the thrift shop and found several shirts/blouses for myself and my honey for 50 cents each. Names like Christopher Banks, J. Jill, Eddie Bauer and Carharrt. I also found some hardcover books to replace some paperbacks I have. I spent just under $6.00 for everything. ~I have been wanting some multi-color Sharpies for a while but didn't want to spend ten dollars or more. When in the next town over we stopped at Office Depot and I found a 12 pack for $5.00, composition books for 10 cents, and a four pack of gluesticks for 25 cents. This is the perfect time to shop for office supplies with school starting. ~Making homemade bread and buns instead of buying them. ~Used a Cherry Pitter I bought at the thrift store a few years ago for $5.00. There are cherry trees in our area so I figured that eventually I would need one. It was made in Germany and I was excited to find that it will pit 2 cherries at the same time. ~Found great deals on Blueberries and Strawberries so I froze quite a bit for cobblers and when I have more time to can. ~Found some charges on our cell phone bill that shouldn't have been there. We called and they were removed. It pays to look over statements all of the time. Thanks again everyone for sharing and have a blessed day! Great finds & ideas! So much to learn from! -Butchered our meat chickens for the freezer. It's sure nice to see our own meat raised & harvested by our own hands! -paid $100 for a used freezer today. Have 2 but needed another one. Are they expensive in your area? Most folks have more than 1 here so they're always in high demand. -still buying grocery gift cert. to use for our major winter shopping trip to the city. the shopping trip will be paid before I shop. It really works well for us since the list is a long one! -baked buns. There's something about coming home to that bread baking smell! -been swathing hay for the guy that bought our hay.....our share will be FREE! Now that's sweet! Judy, loved reading about how you raise, harvest, and put up your food for a year. Living so close to and with nature must be a wonderful experience. I was so thankful to be given 4 bushels of tomatoes this week. I can only imagine the money I saved on making spaghetti sauce, tomato soup and pizza sauce. The savings is endless! Living a simple life while preserving the art of homemaking and homesteading. I was so blessed to have my dad gather apples from a friends tree, I have about 1- 1/2 bushels to make into apple pie filling, apple preserves, and crock pot apple butter. So excited, that was at least a $ 30 savings, love to read how every one else is saving money. this is the first year I did not need to purchase tomatoes to turn into tomato soup. we put up 56 pint. I agree! I love reading Judy's post. Did you check through this thread? She posted some pictures of the wonderful cheese her honey makes. Welcome!!! You are going to just love it here at MJF :) What a HUGE blessing to receive tomatoes. Mine are still green:( Thanks for sharing your blog post and recipe. I can only imagine how wonderful your home smelled mmmmm. That is awesome! I love to glean and make crockpot apple butter. If I can't get any apples from neighbors, in September our University of Colorado Extension sells apples, plums, and pears for a very low price per pound. This year I am stocking up! Good for you with the tomatoes, maybe someday for me! ~Purchased 3 Maidenform bras for $4.00 each. Huge deal. Check out the Maidenform Sale post under Nifty Thrifty. ~One of the local Aspen mills offers free Aspen firewood until Labor Day so we will getting more and taking advantage of this offer. Michael and I brought our trailer and got close to a cord for free. Granted we had to climb up mountains of wood and load it ourselves it will help this Winter. It does burn hot and fast so we will supplement with Oak, Pinon and Cedar. ~Continuing to make my own bread and buns. ~I made a simple syrup with some fresh Ginger to add to our iced tea. When it was done I strained the Ginger pieces and coated them with sugar to use for making Ginger Snap cookies. I also let the sugar air dry and it is now stored in a jar to add to hot teas. ~We had to go to Albuquerque last week for a Dr.s appt. for Michael (VA). It is about a 5 hour drive each way. After his appointment we went to Trader Joes and bought some groceries there. They have a wonderful Crunchy Almond Butter for $6.99. There are certain items that I cannot get locally or for the prices they have at Trader Joes. We also filled up our diesel for $3.76 a gallon versus $3.89 where we live. You ladies sure have been busy. I think its such a blessing for the firewood, we switched to a pellet stove about 3 years ago to cut down of fuel bills. But nothing heats like a wood fire. the kind that melts the bones in the winter. I kind of miss cutting and splitting wood. I also have a list that goes with me to yard sales and the thrift store. my family keeps a list of what each other is looking for. so my aunt picked me up a dehydrator for $4, I want to try to dry carrots, next working on making a blend for my soups to have on hand. already haring the sound of fall and close on its heals winter. I have been making applesauce and dehydrated apple slices with our surplus of apples. I made 5.5 quarts of yogurt today. Made more dishwasher cubes today as well. Sara, thanks for the kind words! Come on up & sit a spell! It's beautiful here! SUPER quiet, just hearing the livestock or the wild life & boy the stars are AMAZING!!!!!!! It looks like you can touch the milky way! Tracy, your spaghetti sauce sounds yummy! That's on my kist when the tomatoes ripen. 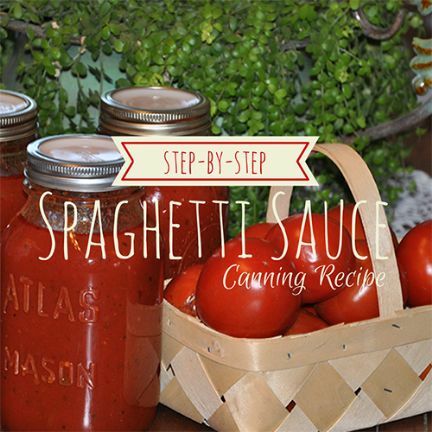 Each year I make a end of the harvest sauce with a tomato base & chunky veggies. It's my true go to supper on THOSE nights. Danyel, APPLES.....yummy! More than anything else they scream fall to me! Usually try to put a couple cases in the cellar for early winter use. My hubby's fav....tomato soup with crackers. Don't you love having extras & don't have can it the next year! Kelly, you sound busy! Dry apple rings every year. Put a bit of cinnamon sugar on the rings before drying. Dry throughly then tie up with some red/green ribbon & attach to Christmas gifts. they're really yummy! I usually dry extras (no sugar) to make christmas garland for my kitchen windows. Have you tried apple leather? Gosh, it sure uses up apples & is better than potato chips for a treat. I put a small bag in the work trucks so we have a snack. After smoothing out your fruit mixture try coconut or cinnamon on top. Sahron, my goodness lady you're busy! thanks for the kind words!!!!! Have to ask if you've worn a Maidenform Bras before? Do they wash up well? When does the sale end? Would like to give it a go. We're seriously drooling over the free wood!!!! Wood is expensive here & we've got 10 cords waiting to get the 2nd split job on it. We've got a back up source of a diesel furnace but mainly use a wood stove. The wood $100/cord for unseasoned green wood....hauling costs $25 / cord but that was a special deal for us. Most folks burn popular which burns ok but the ash is terrible. Birch is EXPENSIVE & HARD to get anymore. Great deal on your wood!! I would have never thought using ginger like you did! Got the old grey cells thinking! I wasted more ginger before I found out you could freeze it. Finally finished the shelled peas, snow peas & snap peas today! I'm over peas & just seeing green now! Our little Izzy (wiener dog) ate sooooo many.....oooooh boy??? I need to roast off the red beets for soup & harvest beets but will wait for some cooler weather. Does anyone have any ides on using up swiss chard. I put it into soup, freezes bags but need something new??? Thanks! Always groom our own dog.....she's so little that it's a small job. I called the closest groomer which is over a hour away & it would cost $ 55 for wash & cut her nails. Wow! Well, super late for us & the oven timer jus went off. Last of the bread....yippee! See you next time! Love hearing the great ideas! I discovered that it pays to shop the ethnic foods aisle. I got a bottle of sesame oil for about three dollars less in the Asian foods aisle than it was in the aisle with the other cooking oils. I also got two overdraft charges reversed when my internet security service renewed my subscription and deducted the money from my account without notifying me first. Cindy, I buy spices & herbs I don't grow on the Mexican rack. Yesterday I bought black pepper and ground cumin for $1.45 a pkg. Also shopped the marked down shelves where they put discontinued items. Got a bottle of walnut oil, date good till 2017, for $3. Like a tsp. of it on my oatmeal. I forgot about this great conversation but I am exhausted reading how busy all of you have been!!! Wow, so many projects all going at once from coast to coast preserving, hauling, stacking wood, and homemade dog food! I am so impressed at what everyone is doing. There is nothing like creative Farmgirls to snag a savings when they get a chance! Truly amazing and so many great ideas shared here as well. So, how about this? I went through my closet this weekend and found some items that no longer fit and posted them and other stuff on Ebay yesterday. I already got a sale today! Ebay is my go to for some items that sell well for making some easy cash and clearing out clutter that I am no longer using. It is not exactly saving money like some of the projects listed here, but it does provide cash that can be used for other necessary items. I'll be stopping back by soon to see what other great savings all of you are coming up with! Don't know how much I saved by using an used padded envelope for Aug. Mail Art. I haven't bought one since the very first one I bought years ago. I save those sent to me to re-use. Saved big time by switching to another man, to clear backyard of fallen branches and cutting back branches growing too near house. First man always charged $175 or more for like work. Lorenzo charged $75. The city will add $10 to my water bill for picking up branches. I figure I save money because it would cost more to have someone else haul it off and pay for dumping.